The NVR security camera systems, compared with traditional DVR counterparts, mark a big step forward in terms of reliability and flexibility. As thieves are becoming more advanced in their techniques, so should you when it comes to bolstering your home security. Whether you need a future-proof surveillance system with easy installation, or plan to upgrade your CCTV Analog security system, the NVR IP security camera systems shall be the best bang for your bucks. The NVR security camera systems are the video monitoring equipment consisting of multiple IP cameras and a network video recorder (NVR), which allow you to keep tabs on different sites 24/7 simultaneously from your phone or PC. Based on the way how HD NVR security camera systems transmit data, they can be divided into NVR wireless security camera systems (the IP cameras connect to the NVR wirelessly) and PoE systems (connect via a network cable). Classified by the channel number of NVR IP security camera systems, the most popular models for sale now are the 4 channel, 8 channel and 16 channel NVR security camera systems. The more channel an NVR home security camera system has, the more cameras you can add to the surveillance system. 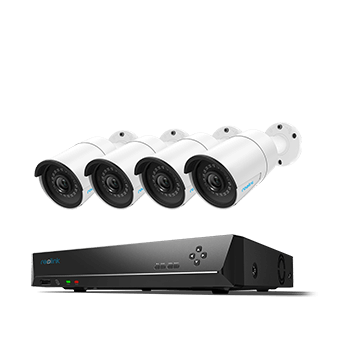 Even if you only need 4 cameras now, it is suggested that you go for the 8-channel or 16 channel NVR security camera systems, just in case that you might have to expand your security system for future use. As mentioned above, the NVR security camera systems far outweigh the DVR systems in many aspects. Below is a list of the unparallel advantages of NVR wireless and PoE security camera systems. The IP cameras included in NVR security camera systems boast high resolution (1080p, 4MP, 5MP and even 4K) with more usable details, while the Analog cameras of DVR systems deliver low quality images and videos. Most IP NVR security camera systems are plug and play and require minimal wires for the setup. You can finish the installation even if you are an outsider. But it can be more complex to install a DVR security system with messy cables involved. Whether you want to move, reposition or add a camera to your existing home security systems, the NVR security camera systems can offer you more flexibility and scalability than the DVR counterparts. The top NVR security camera systems are packed with a host of advanced features, like motion detection, remote access and safe data management which the DVR systems lack of. Editor’s Tip: Learn more about the detailed comparison between NVRs and DVRs. Need help narrowing down the NVR security camera system choices? Skip to the corresponding part and grasp the insider tips if that’s exactly what you expect from a best home NVR security camera system. Look through the product page to see if “plug and play” is listed as a selling point of the PoE/WiFi NVR security camera system. Refer to the NVR security camera system reviews to see if it is truly easy to install as advertised. Check if there are any security camera installation accessories included in the package of NVR security system kit. Watch out for any hidden fees associated with the wireless and PoE NVR HD security camera systems (learn what could impact your security system price). Examine if the NVR security camera systems comes with a built-in HDD. If yes, what is the storage space of the hard disk? See if the NVR PoE or wireless security camera system allows you to add an external HDD to expand the storage capacity. Check if you can adjust the resolution of security camera systems with NVR to maximize the storage usage. Inspect if the NVR security camera systems come with audio, as voice recording can also increase the storage consumption. If yes, you may disable the audio recording in camera settings. Image this: someone broke into your home (hopefully it never happens) but you couldn’t make out who it is from the fuzzy videos. Then what’s the point of spending your hard-earned money in an NVR PoE/wireless security camera system? Choose the PoE or wireless IP security camera NVR systems with at least 1080p high resolution. Watch the video samples shared by real users to see if the HD NVR security camera systems deliver truly sharp images with usable details. Check the IR range of WiFi and PoE NVR HD security camera systems to see how far they can see at night. Inspect the view angle of NVR HD security camera systems to decide how many cameras you need in a certain site, leaving no blind spots without your notice. Below is a high resolution video captured by Reolink PoE NVR security camera system RLK8-410B4 (shared by a real user during the Halloween holiday). One of the big advantages of NVR wireless and PoE security camera systems is that, you can access and manage multiple IP cameras from the NVR on your phone or PC. 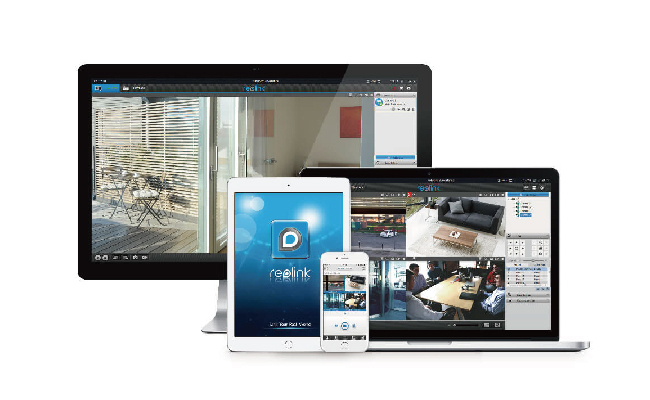 Does the manufacturer of IP NVR security camera systems offer free software (like Reolink App and Client) for Android phones, iPhone, Mac and Windows? Read the NVR security camera system reviews to see if the software is smart, intuitive, powerful and easy-to-use. Did any users complain about the lag when they watch the live feed of NVR security systems? If you have other concerns or problems we miss out, please feel free to leave your comment below! The below NVR security camera system covers all the nice-to-have features mentioned above, and can ensure you a peace of mind at any time, from anywhere. 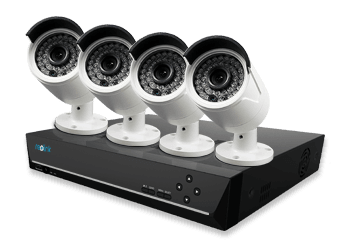 This NVR PoE security camera system allows you to manage up to 8 cameras at the same time on your phone or PC. Watch the video sample captured by this HD NVR security camera system to check out its image quality. 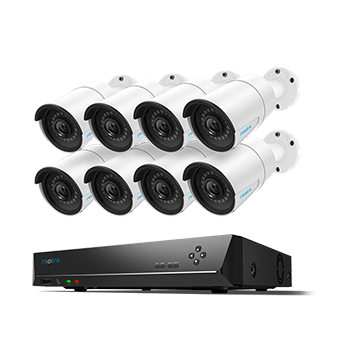 If you would like a 16 channel NVR security camera system, take a look at this top rated system Reolink RLK16-410B8. Important Note: All of the recommended NVR security camera systems can still do 24/7 recording even without Internet, as the cameras can connect to the NVR on their proprietary network. But note that Internet access is required for remote viewing and instant alerts. If you want to watch live feed remotely from your phone, the cellular security systems would be the best security solution. This entry was posted in Buyer's Guide and tagged reviews, security cameras with NVR, security system kits, top picks.